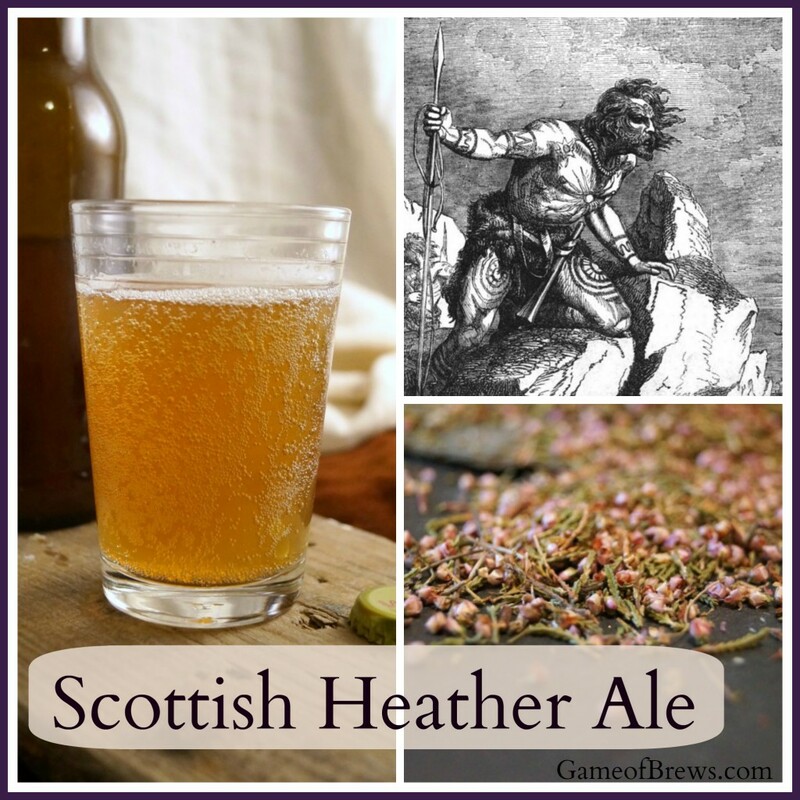 In our world, heather ale (or Fraoch, the gaelic word for “heather”) was enjoyed by the ancient Picts in what is now Scotland. With various conquests and later laws, the original recipes for Fraoch were lost. As the legend goes, the Pictish king, when taken captive, leapt from a cliff rather than share the secret of the heather ale recipe. However, starting in the early 1500s, accounts of making ale with heather began to surface again. Neolithic shards of pottery from the Isle of Rhum tested positive for traces of a fermented beverage made with honey, grains, meadowsweet, and royal fern, made around 2,000 BCE. The first kind of recipe I could find doesn’t show up until the late 18th century, although there are earlier 16th century mentions of using heather for ale. There are also rumors from around 1840 of a manuscript with the recipe for fraoch being found in a monastery near Limerick, then mysteriously disappearing. Later recipes include using treacle, ginger, and other ingredients more readily available as the world grew smaller. However, heather ale remained a mostly hypothetical brew until the late 1980s, when fraoch enthusiast Bruce Williams began looking into how to brew it commercially. The proportions and ingredients for my recipe came from a combination of sources. I incorporated the meadowsweet from the neolithic recipe, and used the 2/3 heather to 1/3 malt proportion from the 1777 work, Flora Scotica. Weighing the same amounts didn’t seem to make sense, given how light heather is, so I went with volume measurements. 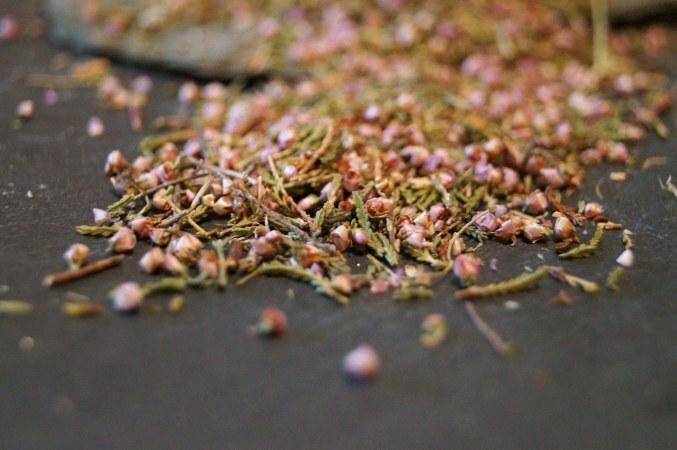 The sweet gale is commonly added to gruit recipes, so I included it in this as well for an added flavor. At the one month mark, my fraoch had great flavor, and was fully carbed. The head didn’t last long, but it stayed pleasantly fizzy the whole time I was drinking it. Beautifully clear and richly colored, it’s a striking homebrew. Flavorwise, it’s lovely. Nice and light, with the slightest floral tones in the nose and aftertaste. It’s a fairly mild beer, but the heather does give it some slight bitterness without the addition of hops, which would add their own distinct flavors. The honey flavor pretty much ferments out. Because of its relatively low ABV, it’s very drinkable in large quantities, and at any time of day. In Westeros, heather ale is an ideal match for a place like Last Hearth. The stronghold of House Umber is located on a large expanse of open land between Winterfell and Castle Black, east of the Kingsroad. I imagine it looking very much like the Scottish highlands, with steep heather-covered hills and valleys cutting through them. While this particular recipe probably wouldn’t be hearty enough for the Greatjon, it would make a wonderful everyday ale for drinking at table with meals. Brewer’s Tip: Measure everything out ahead of time, like they do on cooking shows. It will make you much happier than if you try to measure as you go, in a panic. Mash: Heat 3/4 gallon water to 155F, and add the malted barley and 2 cups heather tips. Cover the pot and swaddle in blankets to keep warm. Allow to sit for an hour. Strain off the water, then sparge by pouring 1/2 gallon of boiling water over the grains. Add this water to the other batch. Boil for 30 minutes. Add half of the remaining heather, and the meadowsweet. Boil the liquid (wort) for 30 minutes, adding the sweet gale, rest of the heather, and Irish moss 10 minutes before the end of the boil. Add the honey 5 minutes before the end of the boil in order to melt it into the water. Strain the wort into your primary fermenter and allow to cool to room temperature. Take an OG reading. Pitch the yeast and attach airlock. When it’s done actively working, prime with 1 oz. honey dissolved in 1/4 cup warm water. How about the four chains of house Umber with each chain representing a season in some fashion. Another method for adding the herbal aromas to your beer is to let the wort ferment through primary, then either in your primary fermenter or to a secondary fermentation vessel, add an herbal tea. My Castle Black Milk Stout was flavored in this way. I boiled 1/2 L of water and let it cool for less than 5 minutes before steeping my heather tips in a French Press for another 5 min. I didn’t know how strong the heather was going to be, so this method ensured a sanitary addition and let me control by taste. I also recommend steeping heather in a loosely tied tea bag in addition to pouring through a strainer/press. I strained, sieved, and decanted my wort through cheese cloth, and I’m still finding little bits of heather in the bottles. Wow, that’s a really great way to use botanicals! I do so love my French Press! I got mine at my local brewing store, https://www.beerbrew.com/, but I think it’s also available on Amazon. I look forward to hearing how you like it! Eh … i’m Italian and after 3 days of research i think it’s impossible for the italian people to make heather ale … mainly because there’s no store that have heather tips and all the american don’t sell in Italy .. i’m burning in rage !!!!!!!! I love this recipe! I made up 5 gallons with 2 oz of scotch soaked oak cubes in the secondary and it ended up with a very citrusy initial taste and a malty finish. OOH! I’ve been meaning to try it over some scotchy woodchips! Great to know! How does it turn out? Close to original? I am trying to make the fraoch receipe..it is ny gavorite beer. I am not sure where to start though. .I did come across a video on youtube of one of the williams brothers making it but they don’t give specifics on ingredients or quantities. This looks amazing. Definitely going to have a go at some of your brew recipes this year! Off to Scotland tomorrow to drink Fraoch on tap! I’m getting ready to make this recipe in time for the Season 4 premier. I found heather flowers instead of tips, any idea if there is a difference when using on over the other. Thanks for the recipe. You mention that this ale has a relatively low ABV. What was the ABV? Would you consider doing it again with a bigger grain bill? Quick question; Is this brew supposed to taste quite sour? Me and a mate made 10L a few weeks ago, and today we tasted the finished brew. It doesn’t taste bad, just very sour. Neither of us have ever tasted heather ale before, so we’re not really sure what to expect. Yeah… We we’re suspecting that something was not quite right. The brew is bottled and I think we’re going to let it sit for a while, might make for an okay drink for a hot summer day. For the meadowsweet did you use flowers or leaves or a combination? Mostly leaves, although I think a few flowers crept in. I am making a first-round of heather beer, but I am using lager yeast rather than ale. And I am not adding anything other than 2-row malt, 3 additions of heather (2 oz for flavor, 2 oz for aroma and a further 2 oz to “dry-hop”). No hops, no specialty malt. Only medium toasted cherry wood as an added flavor (to simulate barrel fermenting/aging). I added a note in the forum, and I’ll be sure to update on progress. Have you done any more of this brew? Any variation compared to the first?